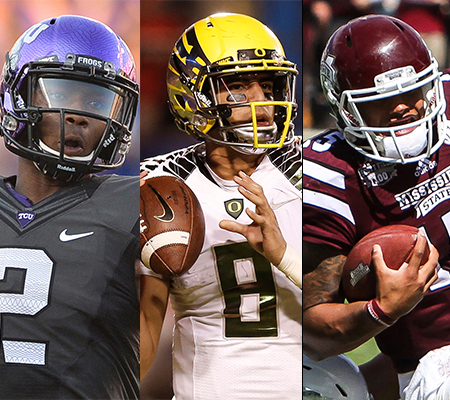 FORT WORTH, Texas (Nov. 25, 2014) – TCU’s Trevone Boykin, Oregon’s Marcus Mariota and Mississippi State’s Dak Prescott have been named finalists for the 2014 Davey O’Brien National Quarterback Award, the Davey O’Brien Foundation has announced. After totaling the ballots from the Davey O’Brien National Selection Committee members as well as fan votes recorded over the past three weeks at VoteOBrien.org, the 16 semifinalists were narrowed down to the trio of junior signal callers. All three players are first-time finalists, and each is looking to become the inaugural winner in his respective school’s history. The finalists’ teams own a combined record of 29-3 (.906), and each squad is currently listed among the top six in the College Football Playoff Rankings, Associated Press Top 25 and Amway Coaches Poll. Boykin becomes the first-ever finalist from O’Brien’s alma mater. He has guided the Horned Frogs to a 9-1 record and a No. 5 ranking in the latest College Football Playoff Rankings. The native of Dallas, Texas, is third nationally in total offense at 356.9 yards per game. He has thrown for a school single-season record 3,021 yards and 24 touchdowns, while rushing for 548 yards and seven scores in 10 games. In addition, Boykin is eighth nationally in both passing yards per game (302.1) and points responsible for per game (18.6). He is on pace to become the third quarterback since 2009 to average over 300 yards per game passing (302.1) and 50 yards per game rushing (54.8). The others were previous Davey O’Brien Award winners Robert Griffin III (Baylor, 2011) and Johnny Manziel (Texas A&M, 2012). Mariota is the third Oregon finalist since the Foundation began selecting three in 1991, joining Joey Harrington (2001) and Dennis Dixon (2007). Mariota’s Ducks own a 10-1 record and are second in the latest playoff rankings. He has passed for 3,103 yards and 32 touchdowns against just two interceptions, while running for 597 yards and nine touchdowns. He is also a finalist for the Maxwell Award. Mariota tops the country in passing efficiency (185.2) and points responsible for (252). In addition, the native of Honolulu, Hawaii, is third in passing touchdowns (32), fifth in total offense (336.4) and eighth in completion percentage (.680). Mariota is the sixth player with 9,000 passing yards and 2,000 rushing yards in a career, a list that includes Davey O’Brien Award winners Griffin III and Tim Tebow (Florida, 2007). Prescott is the first finalist from Mississippi State. With a 10-1 record, the Bulldogs are fourth in the most recent College Football Playoff Rankings and earlier this year moved to No. 1 for the first time in school history. He currently ranks fifth in the nation in points responsible for (216) and sixth in total offense (327.7). For the year, Prescott has thrown for 2,714 yards and 23 touchdowns and rushed for 891 yards and 12 scores. Prescott is the only Football Bowl Subdivision (FBS) player among the top 20 nationally in both passing touchdowns and rushing touchdown, and is the only player with at least 2,700 passing yards and 750 rushing yards. In addition, he leads the country with four games with 200 yards passing and 100 yards rushing. The native of Haughton, La., is also a finalist for the Maxwell Award. After clearing the second round totals, the Fan Vote at VoteOBrien.org reopens for the third round of balloting this evening and will remain open until noon (CT) on Sunday, Dec. 7. 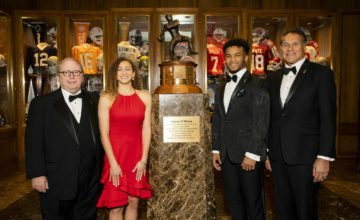 Fans are invited to cast their vote for the nation’s best college quarterback as often as once daily per email address. The Fan Vote counts as five percent during each round of the voting process, and is combined with the results from the Davey O’Brien National Selection Committee, which is comprised of journalists, broadcasters, commentators and former winners. The 2014 Davey O’Brien winner will be announced live on The Home Depot College Football Awards on Thursday, Dec. 11. All three finalists will attend the festivities that day in Orlando, Fla. 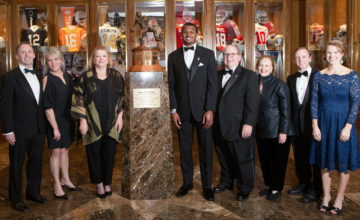 The 38th Annual Davey O’Brien Awards Dinner will be held Monday, Feb. 16, 2015, in Fort Worth, Texas. 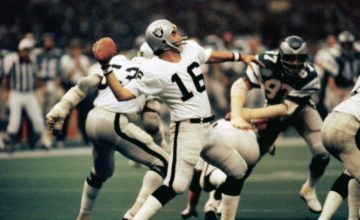 Previous winners include: Jim McMahon (BYU, 1981), Todd Blackledge (Penn State, 1982), Steve Young (BYU, 1983), Doug Flutie (Boston College, 1984), Chuck Long (Iowa, 1985), Vinny Testaverde (Miami, 1986), Don McPherson (Syracuse, 1987), Troy Aikman (UCLA, 1988), Andre Ware (Houston, 1989), Ty Detmer (BYU, 1990-91), Gino Torretta (Miami, 1992), Charlie Ward (Florida State, 1993), Kerry Collins (Penn State, 1994), Danny Wuerffel (Florida, 1995-96), Peyton Manning (Tennessee, 1997), Michael Bishop (Kansas State, 1998), Joe Hamilton (Georgia Tech, 1999), Chris Weinke (Florida State, 2000), Eric Crouch (Nebraska, 2001), Brad Banks (Iowa, 2002), Jason White (Oklahoma, 2003-04), Vince Young (Texas, 2005), Troy Smith (Ohio State, 2006), Tim Tebow (Florida, 2007), Sam Bradford (Oklahoma, 2008), Colt McCoy (Texas, 2009), Cam Newton (Auburn, 2010), Robert Griffin III (Baylor, 2011), Johnny Manziel (Texas A&M, 2012) and Jameis Winston (Florida State, 2013).